bean | Flickr - Photo Sharing! Awalsh, Gunnella, DREASAN, and 5 other people added this photo to their favorites. You're in Chicago? You lucky guy. @Joey, Lucky yes, but the trip was way too short, we left Saturday morning and came back Sunday. We saw a friends art show, had some amazing Cuban food and wandered around a little. Got some nice shots at Warren Dunes on the way back though. We were trying to travel in 'Joey Mode' and enjoy the trip instead of just rushing to the destination. @Vox, here’s another Flickr’s shot that give a better sense of its size. It’s 33’ high by 66’ long. The seams you see in his photo are all polished out now except for the so called ‘omphalos’ or navel area underneath it which was closed off when we were there. I still haven't seen the bean. I'm jealous. It's hard to believe that Millennium Park used to be, I don't know what exactly, abandoned railyards or something, for so long, right there on the lake. Chicago, sigh. It was my first city. Like any other kid growing up within a 75-mile radius, numerous school trips to the Shedd Aquarium and the Field Museum. I once lost my class while in the mummy section of the Field Museum, and to be alone in a darkened gallery with lots of mummies is a pretty memorable experience. @MJ Nice story, I want my mummy! @Kat. It's actually called Cloud Gate. Suposedly the artist is PO'd that the public has dubbed it the Bean. Some interesting copyright issues came up with the piece with photagraphers getting hasseled for taking pictures of the thing. 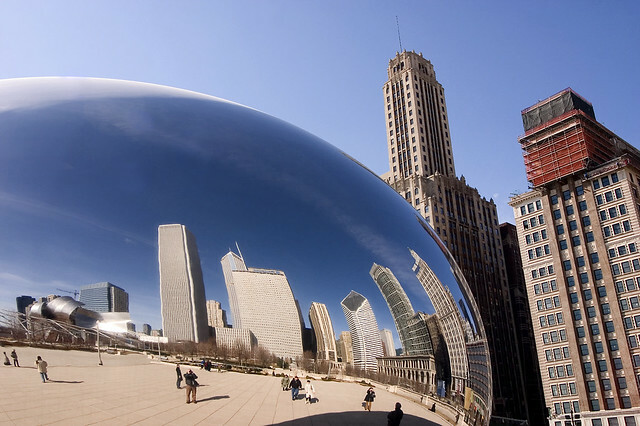 Hi, I'm an admin for a group called Chicago Bean - Cloud Gate Images, and we'd love to have this added to the group! I'm working on collecting images of the same item into various groups. I've started one for the Chicago Bean. I'd be honored if you would add yours to the group. The idea is to see how a single item can be different at different times and when captured by different people.